I'm just catching up from this past weekend. It's Thursday, I know! 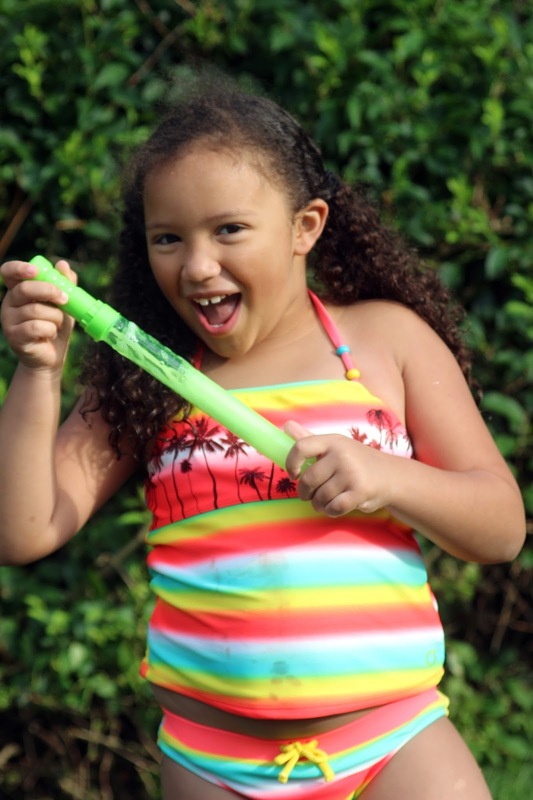 What can I say, the last week of school for Nico has been filled with PTO parties, activities and duties. But today we officially start summer vacation. I'm not sure who's more thrilled, me or Nico. This weekend we celebrated with our annual Father's Day picnic at my Dad's. It's the one thing my Dad asks for every year, for us to gather and me to cook his favorite foods. So I start on Saturday shopping, prepping, cooking and on Sunday while the Dads rest and the kids swim, I man the BBQ. On Sunday night I fall into bed exhausted, but happy. Happy to have so many great Dads in my family. 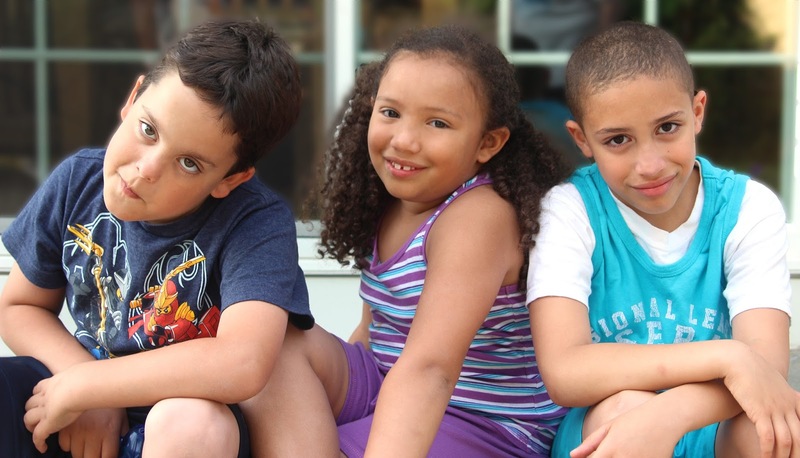 These three are growing up much too fast. If I could keep them this age, I would. They are just the right amount independent, innocent and opinionated. I love just talking with them. Their perspective makes me smile. She is loving everything neon. Who would've thought THAT would come back? I told her that back in the day I wore fingerless neon gloves and gummy bracelets like Madonna. She asked "who the heck is Madonna?". Gasp. 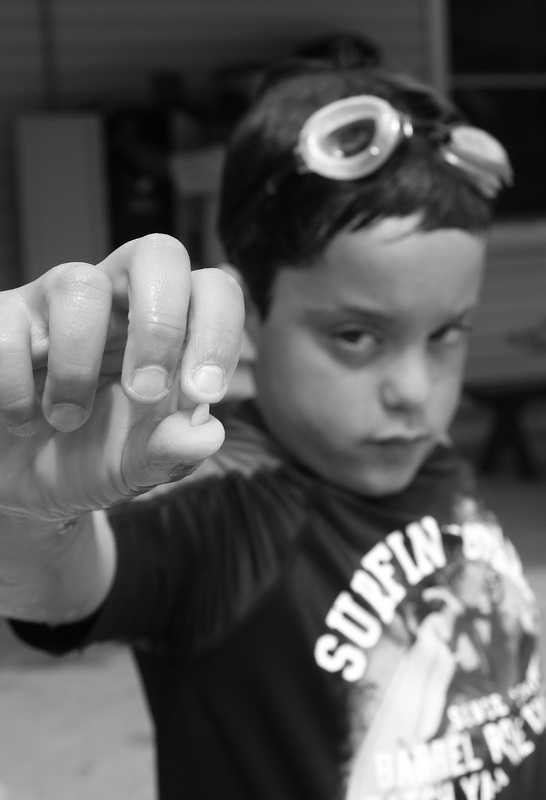 Nico lost another tooth while snorkeling in the pool. He comes out with blood dripping down his chin, hands me the tooth and then jumps right back in. Ahhhh...little boys. Every once in a while I take a picture and really capture their personalities. In this one I got that plus their relationship. 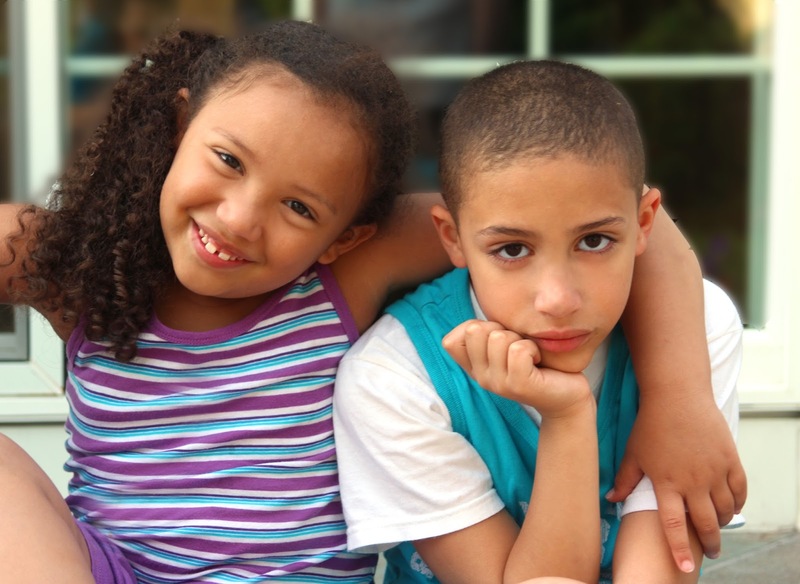 My nephew with his sad little eyes and my niece who is the epitome of bubbly and strong. She protects him fiercely even though he's older. They've been through a lot. I must scrap this one! And this little pip hasn't changed all that much. 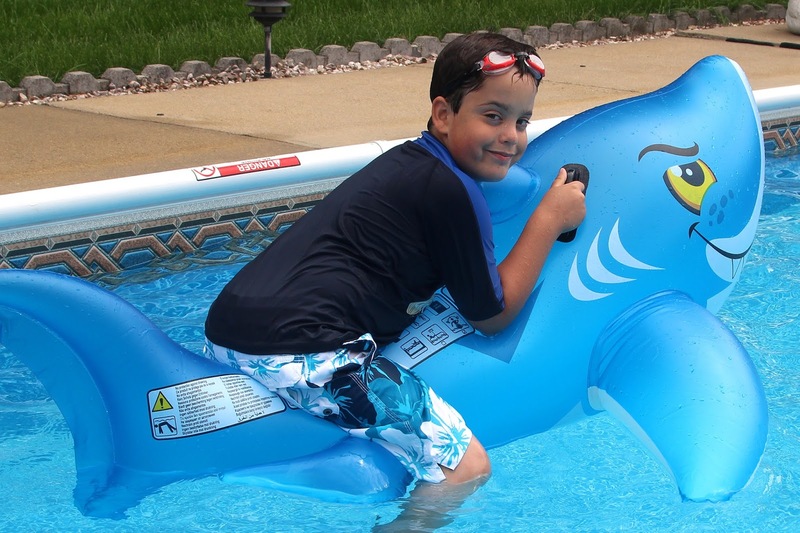 He's still trying to conquer that shark (see below). 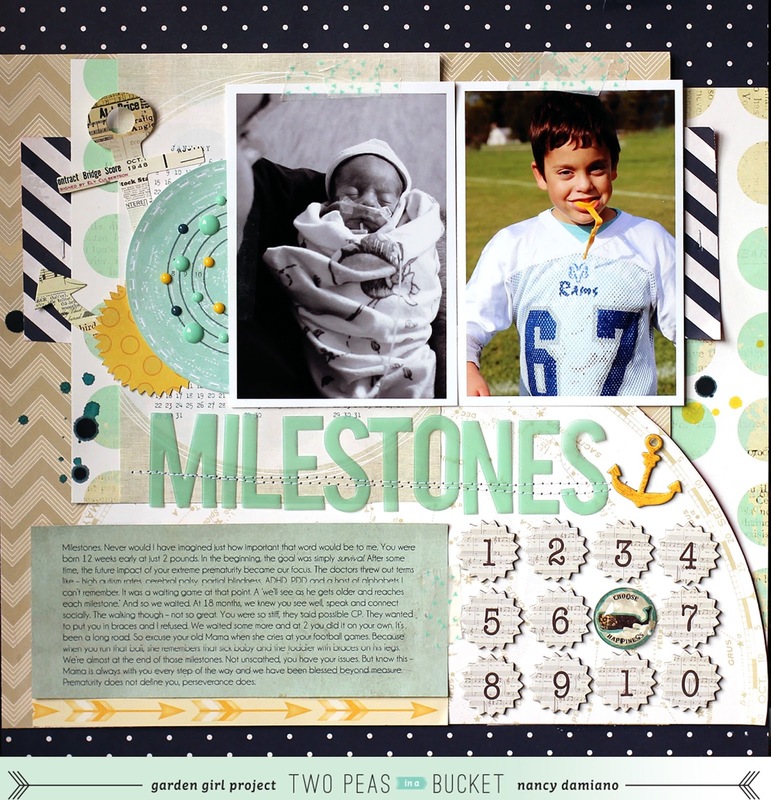 This is a monochromatic layout I made a while ago for 2Peas. I used navy, turquoise and light blue paper and embellishments from the Down the Shore line by Fancy Pants. I started by laying down wide strips of patterned paper in a horizontal pattern. Next, came the two 4x6 photos. To offset all these horizontal lines, I layered the embellishments in a vertical line along the left side of the page. By alternating tags and envelopes I created punches of color and different shapes to the otherwise boxy page. The circle shapes in the buttons, flair and envelope enclosures are also an important design element - they add movement to the page. The monochromatic color scheme and staying with one collection pack, made this page quick and easy to put together. And the photos from last year on the page and the one I took this year prove - the more things change, the more they stay the same. I have a feeling Nico will still be trying to wrestle that shark at 21. This month our Garden Girl theme assignment at 2Peas is milestones. I pretty much knew exactly what I was going to do from the start. Goodness knows milestones have had a significant impact in our lives over the past 7 years. Nico was a preemie. Not a month early, but three. What they call in medical terms a micro preemie. Little miracles who survive, but who oftentimes suffer from the long term effects of their prematurity. So you never know if autism or ADHD or cerebral palsy is in your future. And so over the past seven years we've patiently ticked off some of the most serious complications. But no matter how big and strong he grows, in a flash I can still remember Nico as that tiny preemie. The design was the fun part (it usually is). I started with a mood board that 2Peas provided. I loved the color palette of mint and navy. I added bits of kraft and yellow for a little pop. I used embellishments from the Lucky Charm and Unchartered Waters collections to get this layered look. While you might think that anchors are just a nautical element, they are also a symbol of stability and strength. Constellations remind me of the future and dreams. Stability. Strength. Future. These were all things closely related to the story behind the page. 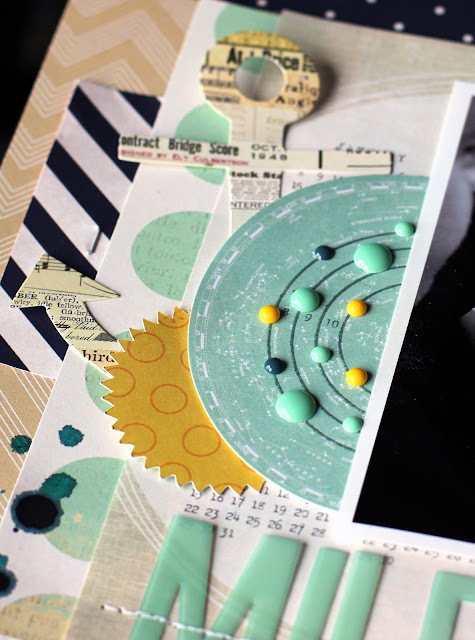 I rarely use embellishments that don't somehow tie into the theming of the page. Sometimes you just have to look beyond the first layer of meaning. 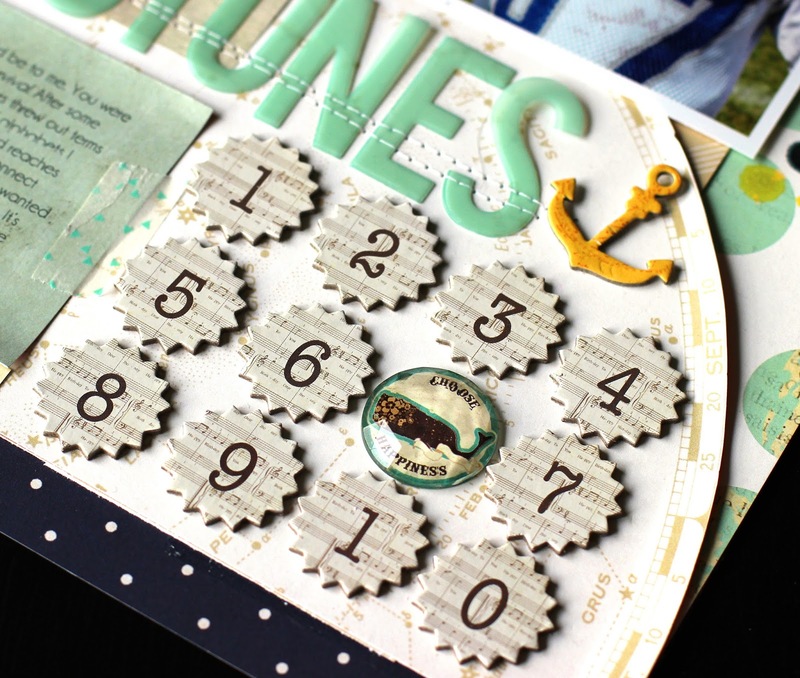 The layers behind the photos include a calendar (the marking of time), an anchor (strength), a sun punch (happiness), and finally a round constellation die cut. I added a bullseye stamp and enamel dots to further embellish the die cut. To balance out the huge title and embellishment cluster, I added a few rows of chipboard numbers to represent the months/years of waiting. The large jewel includes one of my favorite sentiments ('choose happiness') and adds a little pop of dimension to the rows. Telling a story through photos, symbols and pretty paper. This is what I love about design. Thanks so much everyone for playing along. Winners, I'll be in touch with the details. Pay it forward. The idea of asking the beneficiary of a good deed to repay it to others instead of to the original benefactor. I love this concept and I've decided to use it to give some of my extra scrap stuff away. I have two Large Priority Mail Flat Rate boxes full of cardstock and two full of embellishments. They are free to a good home. You pay the shipping through PayPal ($16.85) and pass on the kindness to someone who needs it. That makes me happy (and saves some room around here). 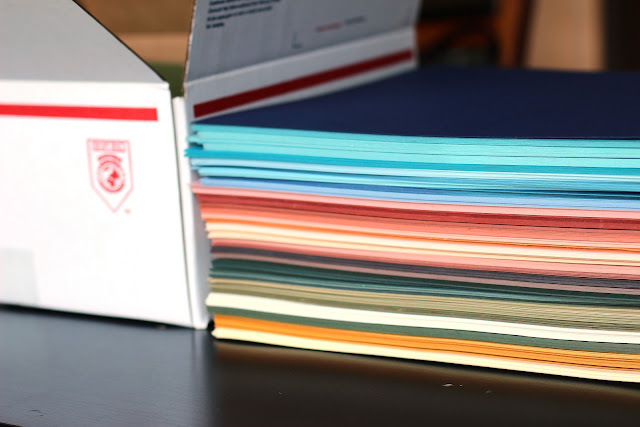 Here's an example of the range of colors that is in each box. It's all Bazzill textured card stock. I'm not sure how many sheets are in there, but it's just about 5-1/2 inches tall. The embellishment boxes measure 12x12x5.5". Here's a peek at one of them. I promise there is more than just Echo Park in there! 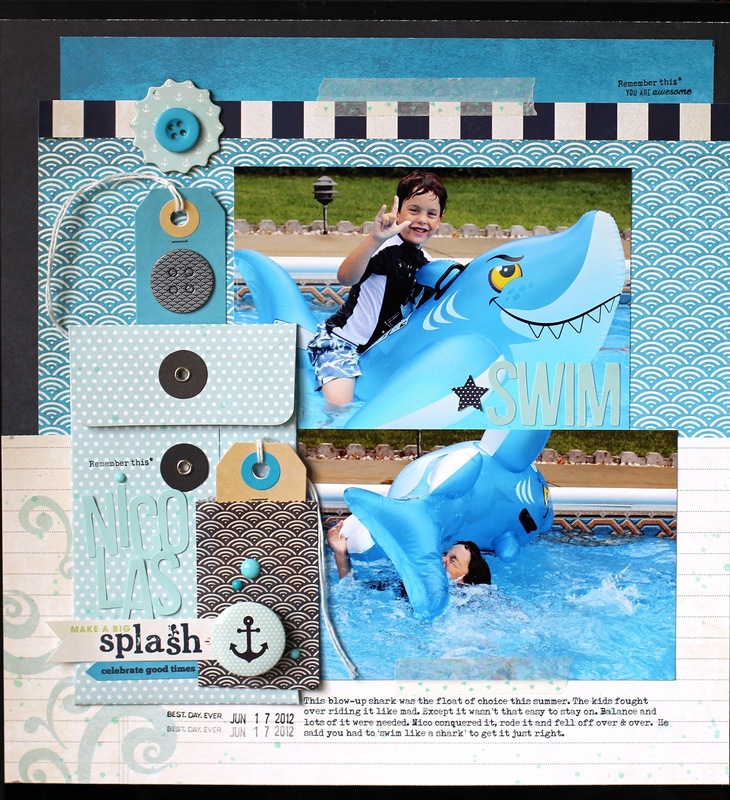 There are 6x6 pads, washi, decorative brad packs, stickers and all types of embellishments. I have two boxes of each. 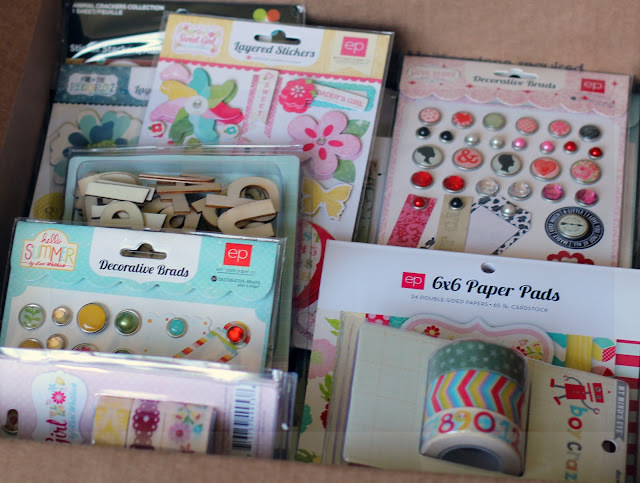 You can request either a cardstock box OR an embellishment box. One box per winner please. I'm shipping only within the U.S. this time. Email me at nancydamiano@gmail.com to win. I will pick four random winners in the morning. I'll email you if you've won with further instructions. Thank you for playing along! Good luck.